Cambridge Audio Stream Magic 6 V2 review | What Hi-Fi? To follow up on the success of the first version of this streamer, Cambridge Audio has released a new, updated version, introducing functionality that helps make this versatile performer even better than before. A lot of things about the Stream Magic remain the same, and that’s no bad thing. It’s still an accomplished network player, capable of both playing back and upsampling most popular file formats up to 24-bit/192kHz, and it can still be used as a DAC and digital pre-amp, bringing its influence on an entire system thanks to a plethora of digital inputs. These include both coaxial and optical digital inputs for hooking up TVs, DVD players or games consoles, as well as both A and B-type USB inputs for connecting laptops and USB hard drives containing music. You can add further functionality by connecting the optional BT100 Bluetooth adapter. Costing £70, it will support aptX streaming direct from a tablet or smartphone. Once you have your source material connected, you simply have to connect the Stream Magic 6 V2 to your amp using the standard RCA phono output or the balanced XLR outputs. So what's changed? Native 24-bit/192kHz playback is now possible over wi-fi as well as via USB thanks to a new, more powerful streaming module that packs a faster processor, doubling the clock speed of its predecessor. This new processor architecture makes browsing menus and accessing music on your network much quicker than before, with load times noticeably shorter. Spotify Connect has now been added as well, alongside its 20,000 internet radio stations, to make this streamer more flexible and versatile than ever. This is all supported by an improved user interface and a brand-new control app, which now work better together for a simpler experience. The app, rather than the included remote control, was always our preferred way of controlling the original Stream Magic 6, but the experience with the new ‘Stream Magic Lite’ is even better. It’s available for Android now, with an iOS version to follow before the end of the year. When it comes to sound, it’s a very similar character to before, and you won’t hear any complaints from us. Powerful, and with a strong rhythmic drive, it has a boundless enthusiasm for any music you throw at it. Play a 16-bit/44.1kHz of Kanye West’s Send it Up, and the Cambridge Audio shows good control over the shrill synth note, never sounding pushed or hard, while vocals are expressive and full of texture, and the bass is tight and agile. It’s a rather manic song, with plenty of different elements that can be tough to keep together as one cohesive whole. However, the Sound Magic Stream 6 V2 manages it with ease, with stacks of detail and a great sense of space and clarity. Fine-detail levels are taken up a notch when we switch up to a 24-bit/96kHz stream of Fleetwood Mac’s The Chain, with a wider soundstage making for a truly natural performance. Detail levels remain impressive on 320kbps streams from the newly added Spotify, offering a decent level of insight without uncovering the fragility of weaker recordings. Dynamically it’s superb across the board too, demonstrating admirable precision with the way it deals with loud and soft, and the starting and stopping of notes. Above all, it’s as captivating as ever, and its new functionality makes it a better proposition than ever before. 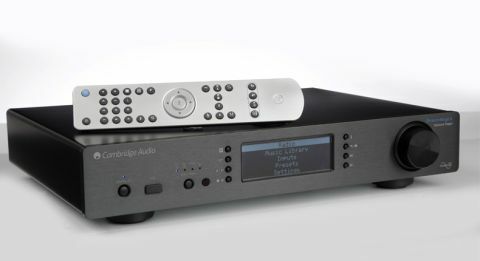 Back on top, and rightfully so – the Cambridge Audio Stream Magic 6 V2 easily earns five stars.